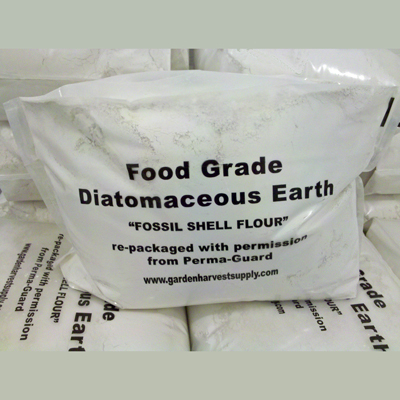 Diatomaceous Earth Food-Grade by Perma-Guard™ is Mother Nature’s product and is safe for the environment, pets, and people. Commonly called Fossil Shell Flour, it is used as an organic insecticide, pesticide, as an internal wormer, for parasite removal in both humans and animals, and for many other uses. Food Grade Diatomaceous Earth (Fossil Shell Flour) has many uses: in the household, with pets, on plants, around livestock, and for stored grain. It is totally organic and listed with OMRI. Read on for the most common uses. Diatomaceous Earth (DE) is used around the house as an organic pesticide for the control of ants, bedbugs, cockroaches, silverfish, box elder bugs, scorpions, crickets, and many other unwelcome pests. Natural bedbug control is one of the biggest reasons for the usage of DE in and around the home. For complete bedbug control, simply sprinkle the area of concern with fossil shell flour . When the pests come in contact with the powder, it is like stepping on broken glass; they will be killed or abandon the area. It is an organic pesticide for ants, bed bugs, cockroaches, silverfish, box elder bugs, scorpions, crickets, and many other unwelcome pests. Getting rid of fleas, ticks, lice, and other pests that bother our your pets with fossil shell flour can be done several different ways. Take the diatomaceous earth and rub a handful into their coats. For natural tick and flea control, simply sprinkle it on their bedding, in the yard, or add it to the carpets. Use the hand held Pest Pistol Duster for easy pet dusting. Use Perma-Guard Food Grade Diatomaceous Earth as a natural insecticide for the non-chemical control of aphids, whiteflies, beetles, loppers, mites, leafhoppers, and other insects. Sprinkle it on fruits, vegetable plants, flowers, grains, and grass—up to and including the day of harvest. Diatomaceous Earth controls insects by using physical, not chemical, action: It punctures an insect’s exoskeleton and absorbs its body fluids—thus posing no harm to warm-blooded life. Moreover, on any surface, this natural pesticide has a remarkable repellency factor. As long as DE is present, insects tend to stay away, making a serious infestation unlikely. The more it is used, the more an environment is created which makes insects feel unwelcome. For young plants, as little as 2 lbs. of diatomaceous earth per acre may be adequate. For larger plants, 5 lbs. per acre is probably sufficient. It applies best when there is dew or after a light rain. It is a long-lasting, natural, effective powder, impossible for insects to build up a resistance against. Watch a video showing Diatomaceous Earth being applied to potato plants. All livestock—horses, cows, pigs, sheep, goats, rabbits, chickens, and others—will benefit from Perma-Guard Food Grade Diatomaceous Earth. Some of its benefits include stimulating basic metabolism; converting feed better; reducing odor and moisture in barns and stalls; improving coat and hoof condition; keeping fly larvae from developing in manure, noticeably reducing the fly population; lowering annual vet bills; killing worms and internal parasites without chemicals; promoting healthier egg production and stronger eggs; and reducing overall animal stress. Sheep, goats, and hogs ingest 1 oz. per day. Cows and horses ingest 2 oz. per day. For chickens and other livestock that you cannot hand-feed individually, weigh their feed, then add 2% of that weight in DE to their feed. As an additional benefit, fossil shell flour (DE) contains over 14 trace minerals which improves animal health. Just add 7–10 lbs. of diatomaceous earth food grade to each ton of grain as it is conveyed into storage. When added to grain, DE kills any bugs that are present. It also protects the grain from further invasion. And bugs cannot become immune! Note: Though completely harmless when ingested, diatomaceous earth—just like any dust—should not be inhaled in large amounts by pets or people. With more than 600 deposits of diatomite west of the Mississippi—and only four (to our knowledge) that can be considered food grade—it is very important that people know what they are using. The vast majority of diatomite deposits are impure. When diatomite is formed, water currents bring in foreign material that mixes with the microscopic diatom shells. This type of diatomite is absolutely without value for practical purposes, but many people tend to think that if it is "Diatomaceous Earth,” then it has the same value as other, purer deposits. There are many places where diatomite deposits can be loaded up "for free,” but generally this substance has no value. If this impure diatomite is sold for practical usage, the customer may end up with an unpleasant surprise. For dry applications, we recommend using a garden duster. Our Perma-Guard Food-Grade Diatomaceous Earth is mined from the purest fresh water deposits. It contains less than .05% Crystalline Silica. We are glad to furnish an analysis upon request. We also have smaller 6-oz bottles and larger 50 pound bags of Diatomaceous Earth available. Read what others are saying about Food Grade Diatomaceous Earth. Comment: This DE I use all the time. I keep a supply on hand. I dust the yard 2 to 3 times a year and we no longer get fleas! Also, I dust the food areas or damp places like the bathroom where Silver fish have appeared and DE clears aways these critters too! Comment: I always purchase from Garden Harvest Supply their Diatomaceous Earth. The price is right, shipping is within reason and the customer service is super!!! Thanks again!!! Comment: Great product, works great for flea control! Comment: Thank you so much for your prompt service. Delivery was almost immediate. I always order my Diatomaceous Earth from you; packaging and product perfect. "It's True D.E. Really Works"
Comment: Have read great reviews throughout and a few have complained about how dusty their homes get when they use Diatomaceous Earth to control pests, but that won't bother me since I use baking soda to neutralize odors and am used to "dust" besides life is dusty anyway :). I do look forward to great results though I know it will take time to see them. Such is life! Comment: First time trying this product. Arrived packaged well. Good Price. Comment: I use DE for parasite control in pets and insect control on vegetables. It can be used as a lite abrasive cleaner also. "Generous size and good packaging"
Comment: I haven't used the DE yet, but it seems to be just as described in the catalog. It was packaged well and arrived with no leakage. I am really impressed with this company from my first order.